Plants are a vital piece of healthy and sustainable wetland ecosystems. Plants are the base of the food chain and can build new layers of organic material on top of wetlands which helps them keep pace with subsidence and rising waters. Wetland vegetation reduces erosion primarily by dampening and absorbing wave and current energy and by binding and stabilizing the soil with roots. Coastal wetland plant species are indicators of soil and hydrologic conditions. The amount and salinity of water in an area influence which plants grow there. 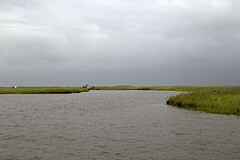 Scientists often classify Louisiana marshes into four types: fresh, intermediate, brackish, and saline. The Coastal Wetlands Planning, Protection, and Restoration Act puts native wetland plant benefits to use through restoration techniques that include vegetative plantings. Vegetative planting projects are used both alone and in conjunction with barrier island restoration, marsh creation, shoreline protection, and sediment and nutrient trapping restoration techniques. These projects use flood-and salt-tolerant native marsh plants that will hold sediments together and stabilize the soil with their roots as they become established in a new area. Invasive species (harmful non-native species) are one of the most significant drivers of global change. Consequently, they can have substantial impacts on the economy, infrastructure, and humans. Society must address invasive species as a priority, which is exactly what National Invasive Species Awareness Week intends to do. The objective of National Invasive Species Awareness Week is to bring attention to the impacts, prevention, and management of invasive species – and all those who are working toward healthy, biodiverse ecosystems. Wetlands provide benefits ranging from water filtration to storm surge protection; however, wetlands have become vulnerable to invasive species. Known as major contributors to wetland and coastal habitat loss, invasive species also threaten native species, including endangered species that rely exclusively on the wetlands for survival. The foreign animals that have been recognized as invasive to coastal wetlands include Asian carp, wild boar, island apple snails, and nutria. Invasive plant species include Chinese tallow, common reed, and purple loosestrife. Invasive animal and plant species have altered the health of wetlands by out-competing native species for food and natural resources, often without any natural predator or control to halt the resulting aggressive spread through an area. CWPPRA strives to protect wetlands by constructing methods to diminish the invasive threat and restore native species’ dominance and health within the wetlands. For a full list of Invasive species in Louisiana, click here. CWPPRA continues to raise awareness and identify solutions to protect our wetlands by implementing projects to target invasive wetland species such as the Coastwide Nutria Control Program and Louisiana Salvinia Weevil Propagation Facility.